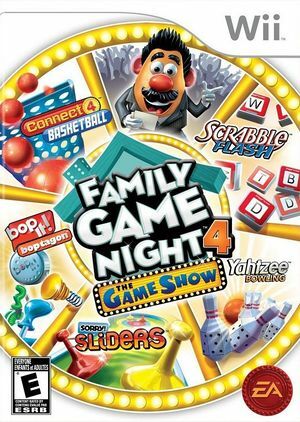 Hasbro Family Game Night 4: The Game Show will have players literally jumping into action with CONNECT 4 Basketball where the first team to shoot four balls in a row of one color wins. They can also scramble to re-arrange virtual word tiles in SCRABBLE Flash – the longer the word, the better the score. Teams will push hard to achieve a bulls-eye or block their opponents with enormous on-screen game pieces in SORRY! Sliders, while YAHTZEE! Bowling will have families chasing down scoring combinations as they “roll” giant bowling balls and knock down pins. Players with a sharp ear and fast reflexes will dominate in BOP-IT Boptigon as players are challenged to execute the right movement at the right time at an ever increasing feverish pace, and the MONOPOLY Crazy Cash Machine doles out big prizes to those who come out on top of Family Game Night. This title does not need non-default settings to run properly. The graph below charts the compatibility with Hasbro Family Game Night 4: The Game Show since Dolphin's 2.0 release, listing revisions only where a compatibility change occurred. This page was last edited on 2 February 2018, at 05:30.